In this week’s Ask Dr. Geier column, I address a question that I am frequently asked – namely which graft option to reconstruct the ACL is best. By no means should you accept my answer to this question as absolute fact, as there are a number of different opinions on the subject. 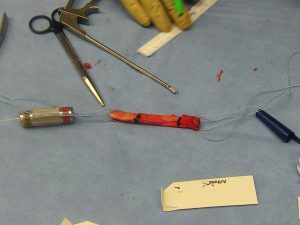 Here are my thoughts on graft options for ACL surgery. I am a sixteen-year-old female soccer player on my high school team until I was injured playing for the Wisconsin ODP team. I tore my ACL about 3 weeks ago, and I’m deciding on what graft to use to reconstruct my ACL. The two choices I have narrowed it down to are the patella graft and the quadriceps tendon. I was wondering what your opinion was on which would be better? This is a fantastic question, and since there are many risks and benefits to each of the graft options, it will require a lengthy answer. I think that it’s great that patients who will be undergoing ACL reconstruction are getting involved in the decision-making process and helping to select the graft rather than blindly accepting the preferences of surgeons. All of us have biases (and I will mention mine here), but a patient making an informed decision is always best. The main graft options for ACL surgery currently are to use either the patient’s own patellar tendon or hamstring tendons or to use a cadaver graft. I’ll start with a cadaver graft (although the reader did not mention it in this question) because it does seem to be increasing in popularity for ACL reconstructions in the United States. Typically they were always used for revision surgeries after the patient’s own tissue had already been used. While I might be biased, I am not a big fan of using cadaver grafts for primary ACL reconstructions unless the patient is older and not returning to competitive cutting and twisting sports, such as soccer. We know that the grafts are not quite as strong as grafts from the patient’s own tissue when the graft is fully incorporated. Plus, several recent studies seem to suggest a higher failure rate (possibly with higher retearing rates) and lower satisfaction numbers. Honestly, it seems to me that surgeons who don’t do a lot of ACL surgeries use cadaver grafts more often, as using the cadaver grafts is easier and quicker. I know that there will be some fellowship-trained sports medicine surgeons who are believers in cadaver grafts for ACL reconstruction who might argue this point, so I’ll just say that this is a personal opinion of mine and many others in the sports medicine world. As far as using the patient’s own tissue, the main choices are patellar tendon grafts and hamstring tendon grafts. Graft options for ACL surgery has its own risks and benefits. Hamstring grafts are popular due to a slightly smaller incision off to the side of the knee instead of the front of the knee. Some surgeons also feel like they can be more aggressive with therapy as the quadriceps muscles aren’t as weak early on. They are probably best used in male manual laborers who kneel a lot, where the patellar tendon graft could be aggravating as the patient goes back to work or male athletes who compete in repetitive jumping sports, such as volleyball or basketball. While many studies have shown that subjective satisfaction rates for both grafts are essentially equal, there does seem to be some data that suggest that these grafts might stretch out slightly in females over time. Whether this fact is significant is hard to know. Also, women are naturally more quadriceps dominant (meaning their quadriceps are stronger than their hamstrings, unlike men), so taking some of the hamstring tendons could exacerbate this problem. I offer it to male athletes and discuss it with females and allow them to make their own decisions. I am partial to the patellar tendon, as it has been the gold standard for decades for surgeries on professional athletes. We have long-term data showing excellent return to sports at the same or higher level with these grafts. I’ve always felt that if we use these grafts for elite athletes, then we should use them on athletes and athletic individuals of all levels. The argument against patellar tendon grafts is a higher incidence of anterior knee pain, meaning pain in the front of the knee, for the first 6-12 months. In my opinion, that is related to the quality and aggressive nature of the physical therapy after surgery, as we rarely see anterior knee pain in patients who work with our therapists and push their quad rehab aggressively. Studies have shown that anterior knee pain is probably more rehab dependent, and also, it is possible to get anterior knee pain with hamstring grafts. I don’t worry about it too much in non-manual laborers. 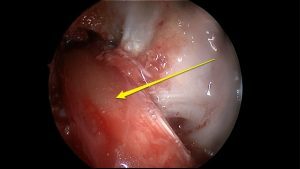 The middle third of the patellar tendon (yellow arrow) is the graft for the ACL reconstruction in this procedure. Interestingly, it seems to me that most people who are reluctant to get patellar tendon grafts say they worry about a long incision. They have seen people with 6-inch incisions down the front of the knee from surgeries done 20 or more years ago. That is certainly understandable, but we can now do these through very small incisions. Like I said, I am biased, as of the 100+ ACL surgeries I do each year, 85-90% of those are patellar tendon grafts. Finally, I don’t have much experience with quadriceps tendon grafts, and I think that those grafts have somewhat fallen out of favor in most of the country except as a backup when other graft options are not available. My concern with a quadriceps tendon graft would be loss of quadriceps strength after surgery and difficulty for the physical therapists trying to regain that strength. If the surgeon feels very confident with these grafts, doing many of these surgeries each year, then the surgery and rehab might go well. Unfortunately for the writer of this question, I can’t say with any degree of certainty that it is a bad option. Like I said, I am biased towards patellar tendon grafts. The bottom line is that there are many options, and patients need to discuss graft options for ACL surgery with the surgeon in order to be on the same page and have the best possible outcome and return to sports successfully.